Thupten Gyatso (Tib. ཐུབ་བསྟན་རྒྱ་མཚོ་, Wyl. thub bstan rgya mtsho), the Thirteenth Dalai Lama (1876–1933), was the immediate predecessor of the current Dalai Lama, Tenzin Gyatso, and one of the most important and long-lived in the lineage of Dalai Lamas. He ruled during a period of political upheaval which saw him forced into periods of exile from 1904 to 1909 and 1910 to 1913. His teachers included Tertön Sogyal who travelled to Lhasa on several occasions to grant him teachings and empowerments. 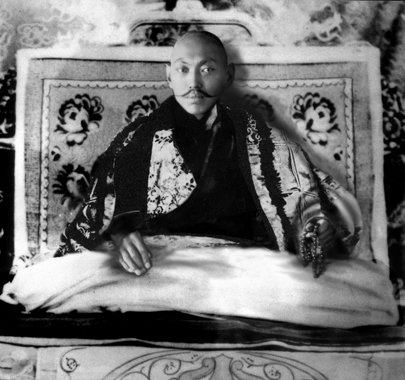 Born near Samyé Monastery in 1876, Thupten Gyatso was recognized as the Dalai Lama in 1878 and enthroned at the Potala Palace in 1879. He assumed political power in 1895. Sir Charles Bell, Portrait of a Dalai Lama: The Life and Times of the Great Thirteenth, Wisdom Publications, 1987. Glenn H. Mullin, Path of the Bodhisattva Warrior: The Life and Teachings of the Thirteenth Dalai Lama, Snow Lion Publications, 1987. Thomas Laird, The History of Tibet—Conversations with the Dalai Lama (London: Atlantic Books, 2006), chapter 10 'The Thirteenth Dalai Lama, 1876-1933'. This page was last edited on 14 June 2018, at 20:08.